From September 19th to 22nd diverse actors of the cashew value chain came together for the 10th Annual ACA World Cashew Festival and Expo in Bissau, Guinea Bissau, which was themed “A Decade of Transformation”. Over 300 participants from all over the globe attended the conference. This year’s conference featured 12 exhibitors, 4 plenary sessions and 6 World Cashew Forum sessions at the Ledger Plaza Hotel in Bissau. The event commenced on the 19th of September with an opening ceremony and a welcome cocktail, which were held at the Ledger Plaza Hotel. Earlier in the day, the Executive Committee, as well as the Advisory Board of the ACA, both met separately at the same venue to discuss the past year and plans for the future. The opening ceremony was attended by six prominent officials from the government sector Ambassador Zumwalt (US Ambassador to Senegal), Mr. Antonio Serifo Embalo (Minister of Commerce and Artisan for Guinea Bissau), Mr. Alez Deprez (USAID/West Africa Mission Director), Mr. Rui Nene Djata (Minister of Agriculture and Rural Development for Guinea Bissau), Ms. Kristina Svensson (World Bank Resident Representative), and Mr. Florentino Mendes Pereira (Minister of State, Energy, and Industry for Guinea Bissau). Honourable Guests included Dr. Kofi Adomakoh (Afrexim Bank), Dr. Adama Coulibaly (Director General, CCA, Cote d’Ivoire), and Ms. Rita Weidinger (Executive Director, ComCashew). Also in attendance were some of ACA’s key founding members Madam Vanessa Adams, Mr. Carlos Costa, Mr. Jorge Oliveira, and many others. This year’s conference was very crucial and proved exceptional in the history of the African Cashew Alliance as it marked and celebrated the 10th Anniversary of the alliance. The first two sessions of the Plenary thoroughly discussed ACA over the past decade and in the coming decade. 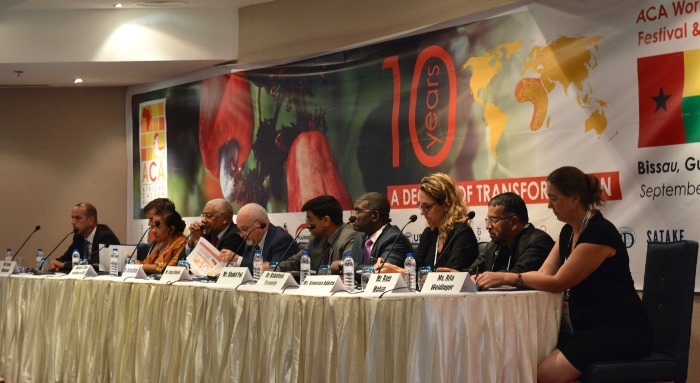 The plenary session included 22 speakers from various aspects of the cashew value chain. The conference featured a variety of seasoned guest speakers and participants from various stakeholder institutions, including Red River Foods, Fludor, CaroNut, Tree Aid, ResponsAbility Investments AG, TechnoServe, Mim Cashew, Nutpak, and many others. On the evening of the 20th, the Alliance welcomed four new members to the Executive Committee after an election conducted and led by the Secretariat. These new members are Mrs. Kone Minata, Mr. Charles Muigui, Mrs. Kate Kamba, and Mr. Florentino Nanque. The Executive Committee also officially welcomed Ms. Johanna Adotevi who will serve the remaining tenure of Mr. Ashak. The new Executive Committee, with newly elected President Florentino Nanque at the helm, chose to start a new initiative of having three vice presidents. Those voted in for this position were Mrs. Kone Minata as the first vice president, Madam Kate Kamba, the second vice president, and Mr. Lars Wallevik as the third vice president to represent the international partners. One unbeatable benefit of the World Cashew Festival & Expo is its ability to summon all actors of the cashew value chain and facilitate important business linkages. This year, over 360 official B2B meetings took place during the conference among ACA members and its stakeholders. The conference wrapped up on the 21st of September with an award ceremony and gala dinner, which included the cutting of the anniversary cake and unveiling of the anniversary video. The night also featured live performances and was graced by the Honourable Prime Minister of Guinea Bissau, Baciro Dja. As has been the tradition of the World Cashew Festival & Expo, the last day was reserved for field trips. This year, participants were given the opportunity to choose either from a learning trip or a leisure trip. The first option had participants going to two processing factories. Some highlights were viewing the use of Brazilian technology in one of the factories. For the second option, participants visited the beautiful town of Caheu, which is located in the northwestern part of the country. Cacheu was a capital in colonial times which served as a trading port for the Portuguese. Participants also visited the historic Cacheu Fort, the oldest church in Africa and many more places. The success of this conference greatly depended on all of our members, stakeholders, speakers, moderators, sponsors and all individuals who contributed one way or another. ACA greatly appreciates.